I am continuing my series on the research I have done on the family of Matilda Stewart and Charles Gordon. Today, I am looking at their eldest child, Margaret Nicol Gordon. Margaret Nicol Gordon was born about 1838, in Scotland. I have not found a baptism for her, or her parents’ marriage, or where they were at the time of the 1841 census. The earliest record found was a mention of a Mr and Mrs Gordon and three children arriving in the Port Phillip District in April 1843. By 1888, Margaret had moved in with her father and brother as they were all living in Dandenong Road East St Kilda, as indicated in the following article. Her father died in 1888. The will of Margaret’s brother Charles Gordon had mentioned that Margaret Nichol Brewer was of “Sand Hill Launceston”, and was the wife of Alexander Brewer. 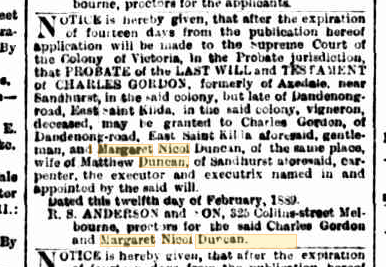 I did a search of the Names Index on the LincTasmania site, and found the marriage of Margaret Duncan to Alexander George Brewer on 19 July 1899 at Launceston. Since the deaths available online for Tasmania only go up to 1912, I haven’t found a death record for Margaret yet. I also was unable to find a death notice for her on Trove, although I did find one for her husband. I then turned to Ancestry, to try and find the deaths for Matilda, George and Matthew. George Matthew Duncan died in 1937 (Reg. no. 17223/1937) at Newtown. His parents’ given names were Matthew and Margaret Nicol. 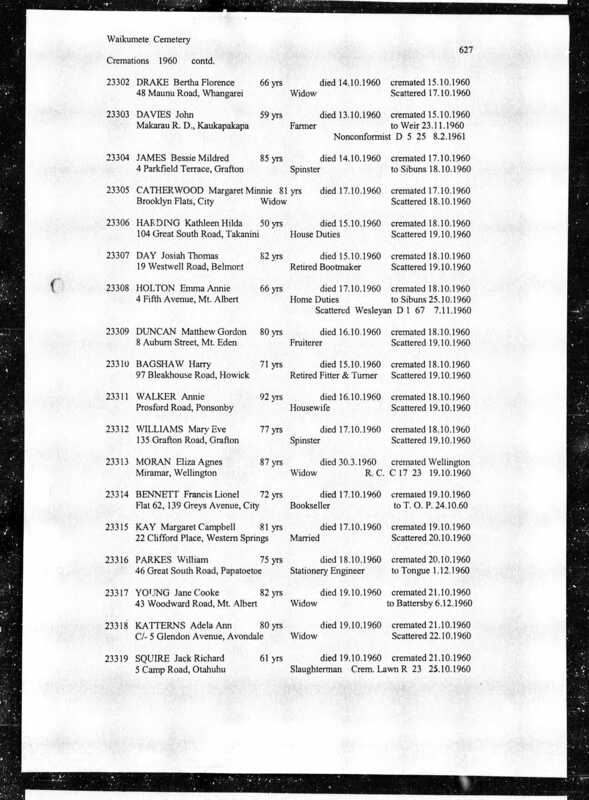 On Ancestry, I found a number of entries for a Matthew Gordon Duncan in the New Zealand, Electoral Rolls, 1853-1981 collection, living in Auckland. I also found a death entry in 1960 at Ancestry, which showed he died in Auckland, so I went to the New Zealand Births Deaths and Marriages website, to see if the entry there had more information. Although the age matches, I still wasn’t sure if this was the same Matthew Gordon Duncan, or not. The death notice for his brother Charles Gordon Duncan indicated that it most likely was. This marriage notice provided enough information to be fairly confident that the death in 1960 was for our Matthew Gordon Duncan. Ancestry also had a cemetery record for Matthew Gordon Duncan. Ancestry.com, “New Zealand, Cemetery Records, 1800-2007,” database, Ancestry.com (http://home.ancestry.com.au/ : accessed 5 Oct 2016), Matthew Charles Gordon, age 80, died 16 October 1960, burial place: Auckland, New Zealand, Cemetery: Waikumete. Matilda Duncan born in 1863 at Sandhurst (Bendigo). She married Angus Robertson, and died 16 November 1903 at Narromine, New South Wales. Jane Fraser Duncan born in 1865 at Sandhurst. She married a man named Embry. Jane died in 1938 at Caulfield. Donald Robert Duncan born in 1870 at Sandhurst. He died in 1970 at Preston, at the age of 100 years. George Matthew Duncan born in 1872 at Sandhurst. He died in 1937 at Newtown, New South Wales. Margaret Nichol Duncan born in 1875 at Sandhurst. She married Alexander George Brewer on 19 July 1899 at Launceston, Tasmania. It is not yet known when she died. Beatrice Made Duncan born in 1883 at Sandhurst. She married a man named Peters, and died in 1973 at Parkdale.